. . . The Hunters. I suppose this is because the core group will be going to college together, where they will meet new characters and find mysteries to solve, both occult and otherwise. I don’t actually remember anyone suggesting this, but I get a lot of email, and my assistant is on vacation. So if you wrote in and recommended “Hunter, ” “Hunters,” “The Hunters” or something like that, let me know and I’ll check for your email and then send you an autographed book—of your choice. I have to say thank you to everyone who participated in this—some of the titles were fabulous and I may—if it’s allowed—use them for individual books in the future. I really appreciate all the suggestions, which ran the gamut from gritty and down-to-earth to high fantasy. I’m so proud that my readers have such great imaginations. What will the three individual books be called? Unless something changes, they will be Phantom, which will should be out in the summer of 2011, Moonsong, and Eternity. I'll post dates for the last two books when I hear them from my publisher. In the meantime, paperbacks called Stefan's Diaries will be coming out. These will be about the TV show, back in the time of the Civil War. None of the Stefan's Diaries books will be written by me, but they may help . . . er, sate your thirst for new Vampire Diaries material. I’m really, really excited about my new website, created by Usok Choe of Usok Choe Designs. Usok is such a nice guy, especially since he’s an absolute genius. He really thinks and researches before he begins work and what he’s done for the site is nothing less than miraculous. It’s what I always envisioned, but that a huge company like Lightmaker couldn’t produce. Since I am about twenty years behind on the technology front (I still remember cute ftp and making sites with Adobe Pagemill) then this is just another blessing I don’t deserve. Speaking of technology, I got a Droid 2 phone and I am doing my best to figure out how to use it. First I had to get my nails cut so that the darn thing would recognize my touch, and then I tried to figure out the apps already on it before getting more. I swear that the phone has taken a dislike to me and refuses to show me my email, while it rolls over like a puppy and will do anything for my more tech-savvy friends. One thing in particular I wanted to do was pick up the CW’s offer of free passages from The Vampire Diaries books, and read them on my phone. I saw in an ad that you can even buy the entire books to read on a phone. Why anyone would want to do this is beyond me, but I guess the young and keen of sight are a different breed. Oh, and sincere thanks to Victoria M. of New Jersey who discovered a lovely new item for a wonderful new contest. Thank you, Vicki! I always appreciate new contest ideas, or new prizes that have meaning to my readers. NEW NEW NEW INFORMATION! Please read! I can't help it--I just can't exclude readers from other countries from this contest. So what I will do is make the Grand Prize, Bonnie's opal ring itself, open to anybody, from any country, on any continent. But the book winners will have to be confined to the USA. Maybe by the next contest I can find some way around that. If you've read Vampire Diaries: Volume 6: Shadow Souls, then you know that Bonnie is sent home with an opal ring set with diamonds, as well as many other pieces of opal jewelry, and I can tell you in advance that this opal ring gains great significance in Vampire Diaries: Volume 7: Midnight. So I can't think of a better prize right now than "Bonnie's Opal Ring"--which has been slightly sized down from its book description (which would hardly be suitable, except as a cocktail ring!). 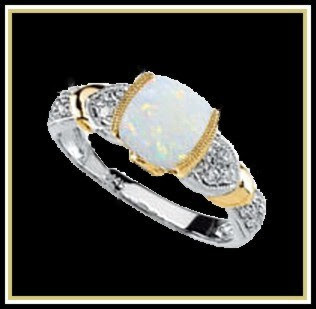 Now you can win this version of Bonnie’s opal ring (see above). It’s made of 14 karat gold and 14 karat white gold, with one central opal and diamonds sprinkled around it. This is a gorgeous ring that sells for over $700—so pretty that I got one for myself! And if you didn’t win an autographed Shadow Souls book during the last contes--well, here’s your chance, because I’m offering ten (10) this time around as second prizes. Unfortunately, I’m afraid I’m going to have to confine the books in this contest to readers in the United States, just because I had so much difficulty mailing prizes to other countries. However, the ring is now available to everyone. To enter, simply send an email to info@ljanesmith.net with the words BONNIE’S OPAL RING in the Subject Field. Please use these exact words, or your entry will not be in the right alphabetical place to be randomly picked for the ring. So if you have sent an email to Opal Ring Contest or Contest: Bonnie's Ring, do yourself a favor and send another with the subject BONNIE'S OPAL RING. Inside, if you like, you can let me know in your email who you think Bonnie should end up with in the Vampire Diaries. Will it be Matt? Damon? Some boy yet to be introduced (and I'm introducing at least two more)? If a stranger what should he be like? I’d love to hear your opinions. This contest will begin September 15, 2010, and end on Halloween, after which the winners will be announced. I'm hoping that I can put up the quotes from winners of this and previoius contests on my new completely refurbished website. Also—I shouldn’t have to say this, but—only one entry from any email address, and only one prize to a home address. Unfortunately, I’m afraid I’m going to have to confine this contest to readers in the United States, just because I had so much difficulty mailing prizes to other countries. Sorry about that—maybe I’ll be able to find a solution in the next contest. To enter, simply send an email to info@ljanesmith.net with the words BONNIE’S OPAL RING in the Subject Field. Inside, if you like, you can let me know in your email who you think Bonnie should end up with in the Vampire Diaries. Will it be Matt? Damon? Some boy yet to be introduced? I’d love to hear your opinions. This contest will begin September 15, 2010, and end on Halloween, after which the winners will be announced. I'm hoping that I can put up the quotes from winners of this and previoius contests on my new website. I realize that I haven't been blogging much lately. That's partly becasue I've been editing Midnight and working out a new contract with Harper/Alloy (my Vampire Diaries publishers) for another trilogy, or arc, of Vampire Diaries stories. Thanks to the many, many people who sent in ideas for names of this new arc--and I'll ferret out the winners as soon as my publishers and I come to an agreement about the name. The other thing that has been going on is a makeover of my website--each and every page changed, I hope for the better. I have a great new webmaster, Usok Choe, of Usok Choe Design, who had wonderful new ideas to revolutionize the site, give it a facelift and make it easier to work with. Now we're both going over it with a finetoothed comb, making sure that everything is consistent and convenient. We're looking to unveil it before Halloween. I hope that visitors will stop by and catch up with the latest Vampire Diaries news, as well as that of my other series. And I hope to be able to blog more in the future. Honestly.